The market brushed the weakness seen overnight to trade around even for much of the session. Just like yesterday it ebbed and flowed around 6220 handle on the ASX 200 with very little conviction for the market to push on in either direction. Today it was the banks offsetting the miners in a reversal of yesterday’s trading. Over the past 48 hours, the ASX200 has traded in an extremely tight range of 36 points and volumes seem light. 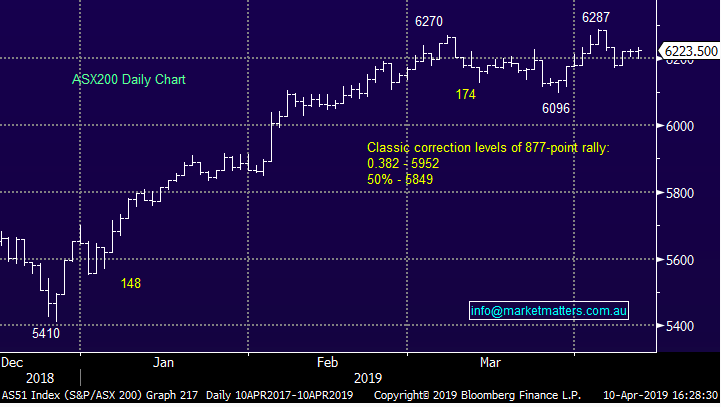 Traders have one eye on US reporting which kicks off at the end of the week, while volumes are light suggesting some have gone on the Easter road trip a few days early. Westpac’s consumer confidence index was out mid-morning and surprised to the upside, jumping back above the 100 point mark vs an expected print of 97. With the figure, Westpac noted that those surveyed after the budget showed higher readings than those before. This helped the consumer discretionary names trade higher, only dragged by Crown (CWN) which reported Wynn had walked from takeover talks. The focus today was on the speech by deputy governor of the RBA Guy Debelle. He touched on a number of topics throughout the speech, but the main sticking point was the time he spent on the disconnect between unemployment and growth at the moment. 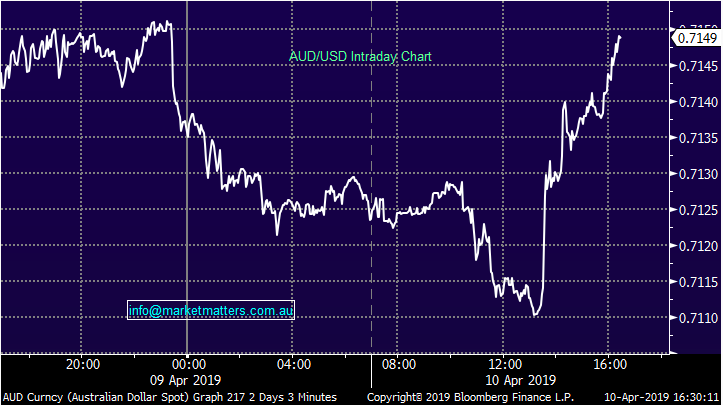 This was enough to see the Aussie dollar jump higher mid-afternoon with traders believing that there is less need to drop rates given the comments. 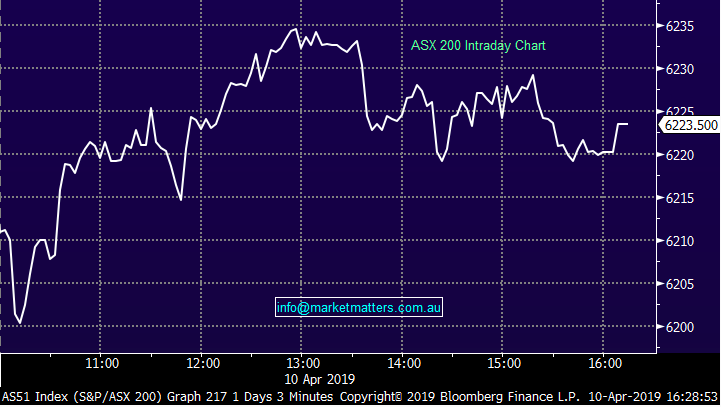 Overall today, the ASX 200 ended up 1 point or +0.03% to 6223. Dow Futures are currently trading up 40pts / +0.15%. 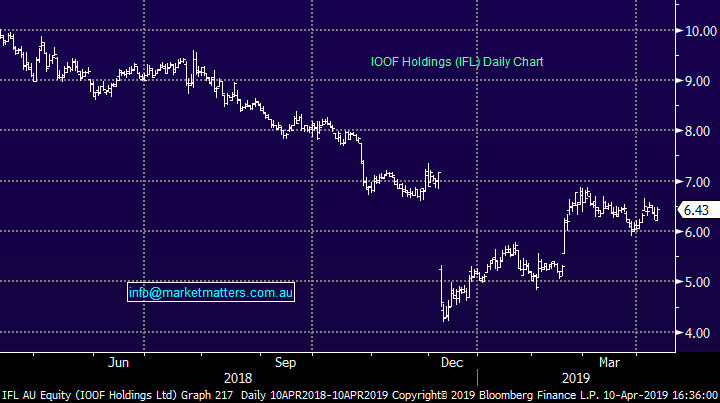 IOOF Holdings (IFL), +1.9%, announced it would be buying the Bendigo Bank financial planning book, trading higher on the news. The book includes around $1b in FUM to be transitioned over to IOOF at a cost of $3m upfront with further payments down the track subject to retention rates. To us it’s a good sign for IOOF shareholders to see the company still looking to grow despite the fallout from the Royal Commission. IOOF is still working with ANZ to get the deal for the pension business over the line while the company and some of its executives remain under a number of APRA investigations. 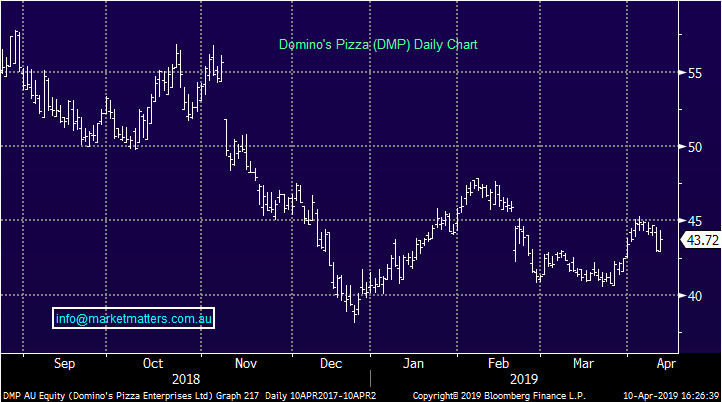 Domino's (DMP), +1.58%, traded higher with the company announcing it would be take control of operations in Denmark. The company has bought the struggling licensee of Dominoes franchises in the Scandinavian nation after the company went into administration earlier in the year. The company is on a European growth push with this acquisition adding another 20 stores to the ~2,700 already in the continent. It hopes to open a number of new stores in Denmark and the rest of Europe to get that number up to 2,850.